This article was originally written for the Terry College of Business by Tom Oder. BACKGROUND: The Student Managed Investment Fund provides undergraduate students at UGA with a unique learning experience through portfolio management, security evaluation, and a support network. Hands-on learning experiences such as the Student Managed Investment Fund are made possible thanks to the continuous support of generous UGA donors. The students are responsible for managing over $1 million in capital from alumni and the University of Georgia Foundation. A decade since its start, the Student Managed Investment Fund (SMIF) now runs a $1.6 million fund while preparing students for careers in financial markets. ​It was the type of discussion you’d hear in a fund manager’s support staff meeting at a major investment company. Barbero’s Walt Disney Co. research revealed a price-to-earnings decrease in multiples in recent years, and he compared that to the share price appreciation during the last three years of almost zero. But Jackson Crispin, who led the pitch to buy Disney shares, was having none of it. “The three-year time frame can be deceptive,” Crispin said, adding “the consistency of Disney’s worldwide brands, their products’ synergistic nature and Disney’s ability to create consumer engagement at all product levels” make the iconic global brand a good buy. Barbero shared his findings on the team’s Groupme messaging app, fueling a robust discussion which continued online into the night. When officers called for an electronic vote most of the team agreed with Crispin, and portfolio manager Zaki Colabawala purchased the Disney shares. Just an ordinary day at the office. Except this wasn’t an office — it’s a pitch session in a college classroom. And Barbero, Crispin and Colabawala aren’t professional investment portfolio managers (yet) — they’re students. As members of the Terry College’s Student Managed Investment Fund (SMIF), the three join a group of 45 dedicated students managing a portfolio of $1.6 million, making consequential decisions with real money. Celebrating a decade at UGA, SMIF prepares Terry students to excel in high-stress careers in global capital market investments. 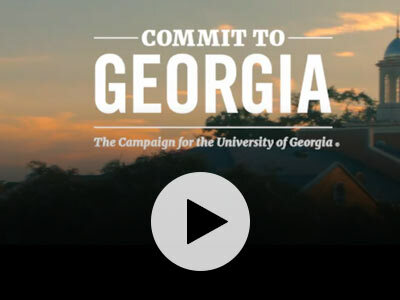 Managing funds from a small portion of the University of Georgia Foundation’s endowment places them under a special pressure to perform, which was the intention from SMIF’s start. “The idea was to create a program that would give undergraduates interested in capital markets and investment management the opportunity to manage a portfolio with real successes and negatives in making or losing money with the goal of helping students get jobs when they graduate,” says Darren DeVore (BBA ’86), who with his wife, Pam (BFA ’86), created SMIF with a generous gift in 2006. The program has a deep history which has thrived in the years since, and now boasts the state-of-the-art Benn Capital Markets Lab as its prime meeting space. Located on the first floor of Amos Hall in Terry’s Business Learning Community, the lab has 12 Bloomberg terminals with six laptop inputs at each work table. Three, 90-inch LED monitors adorn the walls, which can link with the lab’s cable TV feeds, and a NASDAQ ticker scrolls continuously above the labs outside doors. DeVore has spent nearly three decades in institutional investment management. He started with Pacific Investment Management Co. and Artisan Partners before forming Broad Pine Investments, an Atlanta holding company for his private equity and venture capital interests, where he is managing partner. When he joined the Terry College Alumni Board in 2004, he asked what happened to the Recording for the Blind Foundation portfolio. No one knew. Because managing real money in college was so instrumental to his career, he and his wife decided to establish a similar program. Their vision became SMIF, now a three-credit hour elective class spanning the spring and fall semesters. It perennially attracts the most motivated finance majors. Of Terry’s 1,500 junior and senior finance majors, 150 apply for SMIF each year. Only about 40 are chosen as new “analysts” in industry sectors mimicking S&P sectors. The average GPA of applicants is 3.60, the average GPA of interviewees is 3.66 and the average GPA of SMIF students is 3.84. SMIF is open to juniors and seniors, but to return for a second year, students must reapply their senior year for a limited number of leadership positions — leaders of eight industry sectors or one of three class officers. The 2018 SMIF sectors, which vary from time to time, are discretionary, energy, healthcare, industrials, media/telecom, real estate, staples and technology. Historically the students outperform the S&P. From Dec. 31, 2007, to March of this year, classes grew the fund’s balance by an average of 9.28 percent annually, according to SMIF’s records. During the same period, the S&P 500 Total Return Index grew at an 8.54 percent annualized rate. But an important measure of success for SMIF is not how well students perform against the S&P. Rather, its career placement. By that benchmark, students achieved a high bar — résumés of interns and graduates include the names of high-profile firms such as JPMorgan Chase, Goldman Sachs, Citi Group, Credit Suisse, EY, Deloitte and SunTrust, among others. The initial class was selected in spring 2006 and met for the first time that fall in Sanford Hall. The class briefly traded in Yahoo hypothetical accounts because “we were not up and running with real money until late spring 2007,” says Chris Stivers, who served as the first faculty adviser from 2006-2010. Stivers, an associate professor at the time and now a professor and associate dean for undergraduate programs at the University of Louisville, worked with Annette Poulsen, the present SMIF faculty adviser and Sterne Chair of Banking and Finance, to create SMIF as a formal academic class rather than a club. “The premise was build it and they will come,” Stivers says, referring especially to funding. The university chose Morgan-Keegan’s Athens branch as SMIF’s broker and, after some administrative delays, deposited the DeVores’ gift with earnings in April 2007 (Morgan-Keegan merged with Raymond James in 2012). The account was set up as a long-run portfolio, and the first trades were made, with long positions taken in 16 stocks. In the meantime, a board of trustees organized to oversee SMIF met for the first time in Brooks Hall. Poulsen became faculty adviser in 2013 and quickly earned the students’ trust. At the time, the students wanted more self-determination about how the course was managed and how students learned about investment opportunities — so Poulsen literally took a back seat and let SMIF’s officers lead the discussion. SMIF was so OK, in fact, that UGAF’s Investment Committee voted unanimously in 2015 to invest $750,000 from its endowment in the fund. That investment was a major goal of DeVore’s because it increased SMIF’s capital from $354,000 to a corpus of more than $1 million. It also meant students had to present formal investment reports to the investment committee because the university was now essentially SMIF’s client. “I thought these would be exceptional experiences,” DeVore says. Poulsen emphasizes these experiences also lead to what she calls a mentoring and tutoring spillover effect. “A student may be in SMIF,” Poulsen points out, “but they are also in other classes. The SMIF student will say, ‘Come on! Let’s go use the Bloomberg. I’ll show you how.’ ” The spillover even affects professors and improves how they teach some classes, she adds. SMIF students are aware these undergraduate experiences are invaluable in helping them prepare for careers after college. “I have learned real-life investing skills, valuation and, most importantly, how to think like an investor,” says Mark Foreman, SMIF president and a finance major from Atlanta who’s joining Luminate Capital Partners after graduation. “SMIF really helped me improve my presentation skills, taught me how to work within groups, defend my ideas and help me understand the fundamentals of valuation and finance,” adds Helen Woodland, a finance and international affairs double major from Atlanta who will go to work for UBS Global Equity Derivatives group. In 2015, former SMIF President Wes Roberts (BBA ’15) started the Stock Pitch Challenge to give college students from across the country the opportunity to gain experience researching an investment idea and pitching it to experts. “We hoped it would strengthen the reputation of SMIF and the finance program at Terry,” Roberts says. Now in its fourth year, the Stock Pitch Competition as it is now known has done exactly that. This year’s contest attracted 10 universities, corporate sponsors and awarded prizes totaling $10,000. 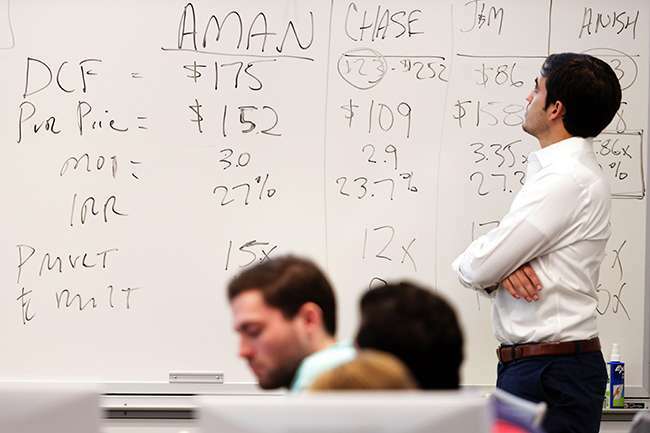 SMIF Vice President Ramin Parsa called the responsibility of running the contest “the most challenging and rewarding experience I have had at UGA.” Parsa, a finance and economics double major from Marietta, joins Macquarie Capital after graduation. This year’s SMIF student officers — Foreman, Parsa and Colabawala — joined Julie Rhodes, a career and professional advisor in the Terry Finance Department, for a trip to New York in February seeking to establish or expand relationships between Terry/SMIF and asset managers in investment banks on and off Wall Street. SMIF Board Chairman Mitch Reiner (BBA ’05), COO and managing partner at Capital Investment Advisors in Sandy Springs, wants to see Terry and UGA build on the successes of SMIF’s first 10 years by creating what he calls SMIF 3.0. Reiner’s vision is for the next iteration of SMIF to impact more students, especially women. Reiner, who was recruited by DeVore to chair SMIF’s board in 2012, is so proud of SMIF and its students and has a message for private equity firms on Wall Street and elsewhere. He says SMIF graduates will outperform colleagues because they have grit, determination and a chip on their shoulder about the out-sized influence given Ivy League graduates.